If there was a Big Bang, when was it? 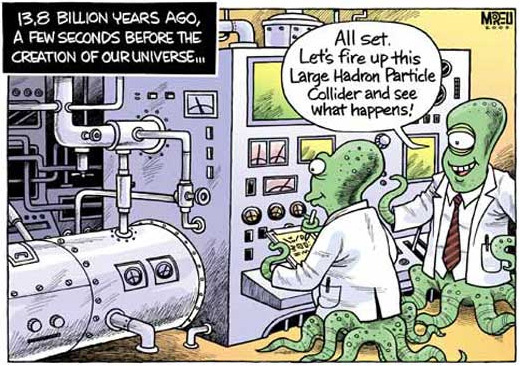 Scientists say that 13.7 billion years ago, something happened! Everything we know that has ever taken place has happened (so they think) after that event. Time began with that event. And what was the event? Well, scientists think that 13.7 billion years ago there was absolutely NO distance between all the different parts of the Universe. Our entire Universe (they say) was like a single point – a singularity. The theory then says that . . . that tiny point suddenly burst outwards making the most incredible, totally awesome . . . explosion! At that very moment, scientists say that space began expanding and it has been expanding ever since, carrying everything (galaxies, stars, etc) with it. In 1931, Georges Lemaître came up with his hypothesis of the ‘primeval atom’ – the first real big bang theory of the origin of the Universe! How do we know when something happens? Well, there’s usually some evidence for it. What scientists do is look very carefully at everything we can see now and try to create a model which might best explain it. Then they test the model by gathering observations that support it and looking for any that seem to show it’s not true. The observations that back up the Big Bang Theory – are the ‘evidence’ for the theory. At the moment, most scientists agree that The Big Bang Theory is the best model we have which explains what we see in the universe today. One could say that the story about the evidence for the Big Bang began in 1927 when Georges Lemaître published a paper in which he presented his new idea of an expanding Universe and he even derived the so-called ‘Hubble’s Law’. 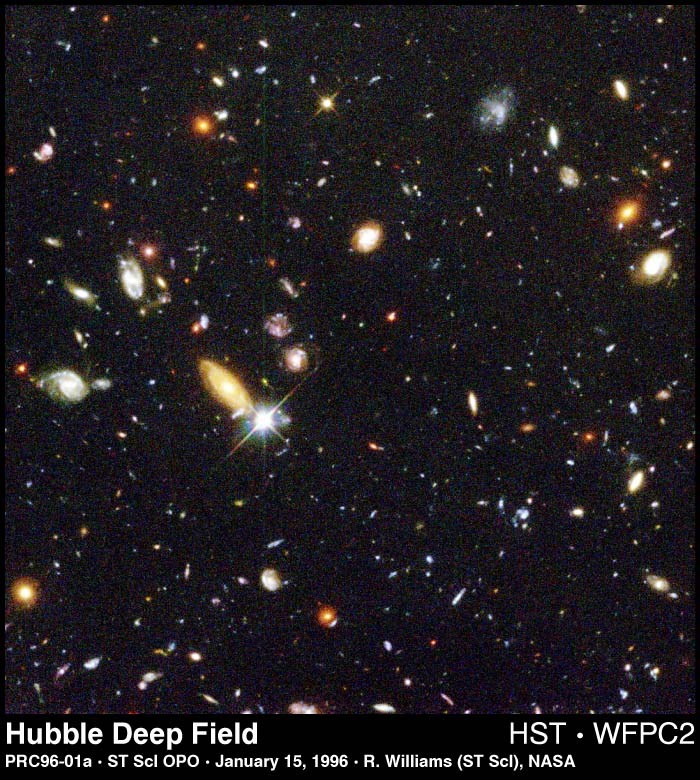 Two years later, in 1929, Edwin Hubble’s observations confirmed the expansion and he got data for the law which now bears his name – Hubble’s law. If this theory is right, then, every galaxy outside our own Milky Way galaxy is moving away from us at an extraordinary speed – a speed that is proportional to the distance the galaxy is away from us. That would mean that the farther away a galaxy is to us, the faster it is speeding away from us! Scientists were astonished when they realised the implications of the simple mathematical relationship (between distance to a galaxy and speed) for the beginning of the Universe. If this is what’s going on, then, moving backwards in time, it means that 13.7 billion years ago there would have been a moment when the entire Universe consisted of a single point (a singularity). This is the instant when scientists say time and all things material began. In fact, it was Lemaître again (in 1931) who came up with the notion that the Universe had expanded from a single, initial point which he referred to as the ‘Primeval Atom’ . . . in Lemaître’s own words it was “the Cosmic Egg exploding at the moment of the creation”. This hypothesis was the first real big bang theory of the Universe! The explosive event from a primeval atom (or cosmic egg or singularity as it has also been called) is what we now call the Big Bang! Gathering observations to test the idea that the Universe is expanding is an ongoing process. 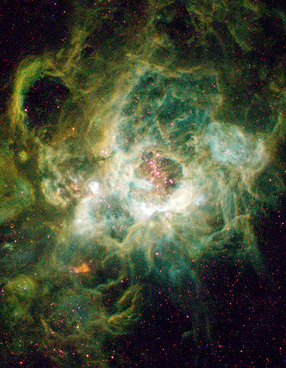 Two of NASA’s space telescopes, the Hubble and the Spitzer Space Telescope have both been gathering data. This is the Hubble Space Telescope in orbit around the Earth. It has recently been retired. What do scientists think happened next . . . just after the Big Bang? Just a tiny fraction of a second after the Big Bang (i.e. 1 over 10 to the power of 32 of a second!) 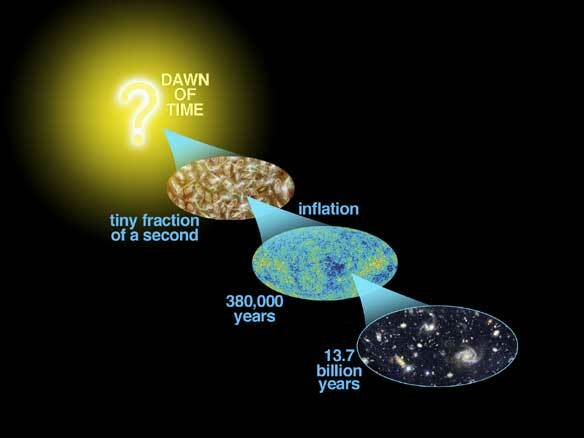 , scientists theorise that something called inflation occurred – that is, the Universe grew exponentially in size very quickly. A lot of action was packed, they say, into that very first second! One second (a very l-o-n-g second!) after the Big Bang, scientists say the Universe was nothing like it is today – imagine an unimaginably hot soup (around 10-billion degrees Celsius!) of particles smaller than the size of an atom (neutrons, protons, electrons, positrons, photons, and neutrinos). Immediately after the Big Bang, the Universe began to expand and to cool at the same time. The 11th February 2003 is a date etched into the minds of most astronomers, because on that day the most conclusive evidence yet for the Big Bang to date was announced (by NASA’s Wilkinson Microwave Anisotropy Probe – WMAP – team) – evidence, some scientists say, that the Universe may well have begun with a violent, almighty rush of energy, known as the Big Bang. John Bahcall, an astrophysicist at the Institute for Advanced Study in Princeton New Jersey, declared that with this evidence, the science of cosmology shifted from “speculation to precision science” (Astronomy, April 2003). What WMAP did was to accurately measure the faint leftover heat from the Big Bang, producing two full-sky pictures of cosmic microwave radiation. Because distances are so massive in the Universe, and because the explosion which scientists think may have occurred 13.7 billion years ago, took place so very long ago, it is extremely difficult to gather solid evidence which might help in the quest to find out more about our Universe’s origins. WMAP’s 3-year all-sky map of cosmic microwave radiation, February 2003 – showing the temperature of the microwave background radiation with tiny variations (of few microdegrees) in The 3K background. Hot spots show up as red, cold spots as dark blue. Just after the Big Bang – from that first second to up to a few hundred thousand years old – scientists say that there were no atoms in the Universe at all. The Universe consisted of only energetic radiation and a furnace-hot, incredibly dense, soup of particles. So dense was this mixture of particles that scientists argue that radiation (photons) couldn’t travel very far before bumping into particles (electrons). In a way, you could say that the radiation was ‘trapped’ in this soup of sub-atomic particles, making the early universe opaque – as though it were shrouded in dense fog. Scientists suggest that it was only about 380,000 years after the Big Bang, when the temperature of the Universe had cooled to around 3000K (2727 Celsius), that the earliest atoms began to form as nuclei attracted electrons to themselves . . . and kept them! According to scientists, these were the very first complete atoms in the history of the cosmos. Photons of radiation could now travel freely through space. Quite suddenly, it seemed that the fog had lifted and the Universe became transparent. The radiation from that early Universe, which remember was actually the leftover heat from the Big Bang, continued to cool down over billions of years (13.7 billion to be precise!) to the temperature it is today, i.e. 2.7K (at around -270 Celsius that’s pretty cold!!). This leftover heat radiation (now quite cold!) – the afterglow of the Big Bang – is what scientists call cosmic microwave background radiation (CMB) because it falls in the microwave section of the electromagnetic spectrum. The observation of the CMB radiation in 1965 by Penzias and Wilson was seen my many as the clinching evidence for the Big Bang theory – killing off the rival steady state theory (supported by Fred Hoyle amongst others). 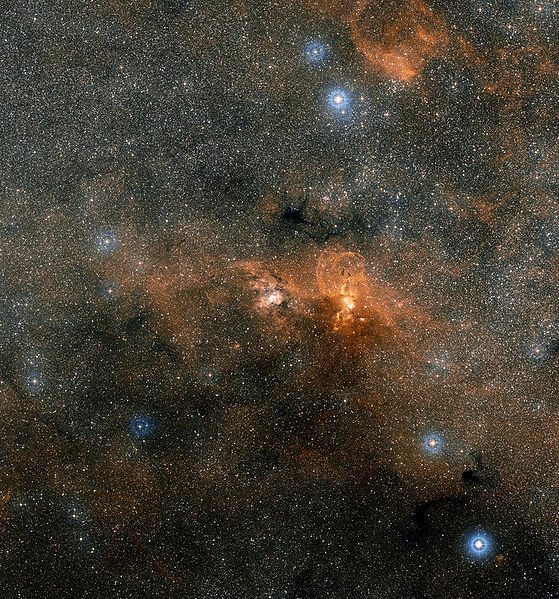 With the passing of even more time after the first atoms appeared, scientists suggest that chunks of matter might have lumped together to form stars . . . but that’s another story! The picture below is a scientific model or representation of the evolution of the universe over a period of 13.7 billion years. At the far left you can see the earliest moments scientists have explored, i.e. 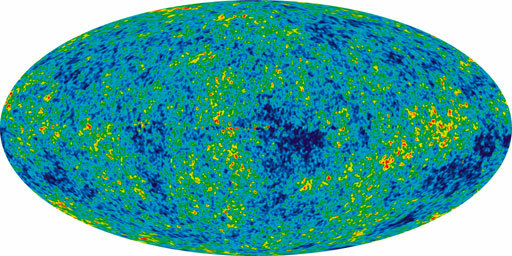 the period of inflation which scientists think generated a huge burst of growth in the universe (Size is shown by the vertical extent of the grid in this graphic from NASA). Over the next few billion years, it’s thought gravity came into play and pulled the matter in the universe in on itself – the result was that the expansion of the universe gradually slowed down. Scientists have more recently suggested that the expansion of the Universe has begun to speed up again because they think the repulsive effects of dark energy have begun to dominate over the effects of gravity. Dark energy is not something scientists know an awful lot about. In fact if you ever want to put an astrophysicist (or any scientist for that matter) on the spot, just ask them this question: hey, what’s dark energy? What is The Large Hadron Collider (or LHC)? When you want to find out how something works, what do you do? Well, if you’re like me, you pull it apart, all the while trying to remember (or keep a record of) how you did it so that you can put it back together again. Trying to find out how atoms work isn’t quite that simple. For one thing the bits and pieces (sub-atomic particles) that make up an atom are simply too tiny to tinker with! So, physicists came up with the ingenious notion of accelerating two beams of sub-atomic particles (e.g. protons or lead ions) inside an immense tube-shaped tunnel or accelerator ring, the particles’ energy increasing with each lap they make. 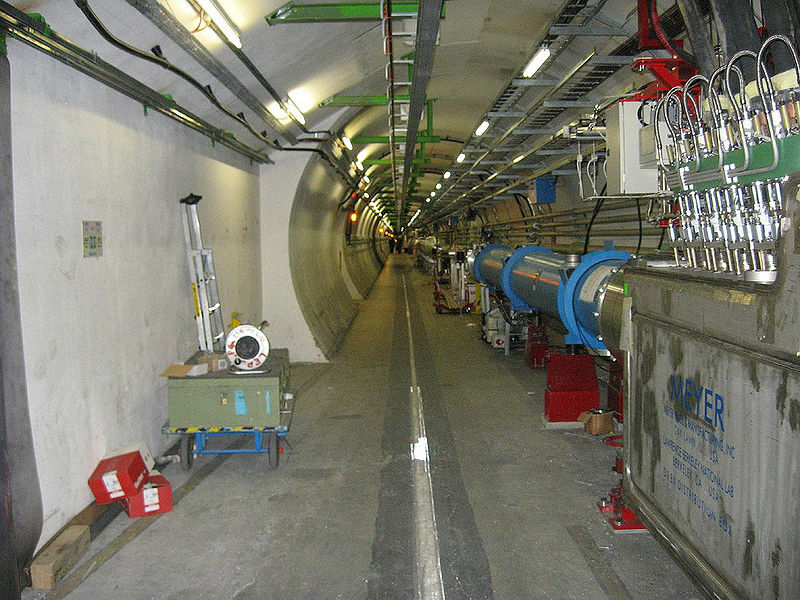 Of course, the beams, travelling in opposite directions, are kept in two separate beam pipes until they are allowed to collide at specific controlled points along the ring. There are four locations around the accelerator ring where collisions can be made to occur. 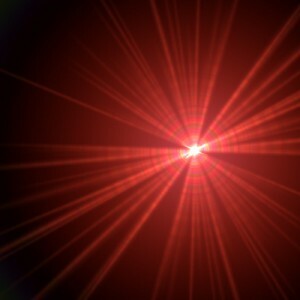 By allowing the beams to collide at very high energy, the particles (e.g. protons) smash up into even smaller sub-sub-atomic particles. The task of bringing about collisions is not as easy as it may sound because the particles are so very tiny that collisions are infrequent. But when they do happen, these collisions are analysed by particle detectors placed at the four locations where collisions are set up to occur. So, the whole purpose of the Large Hadron Collider is to attempt to re-create the conditions one billionth of a second after the event known as the Big Bang. And how are scientists trying to do this? By smashing up sub-atomic particles into their even smaller constituent particles (sub-sub-atomic particles), they think they might be able to find out what the Universe was like at that instant when all the matter that they think existed in the Universe was a soup of sub-sub-atomic particles, and space had just begun its expansion as it also began to cool. 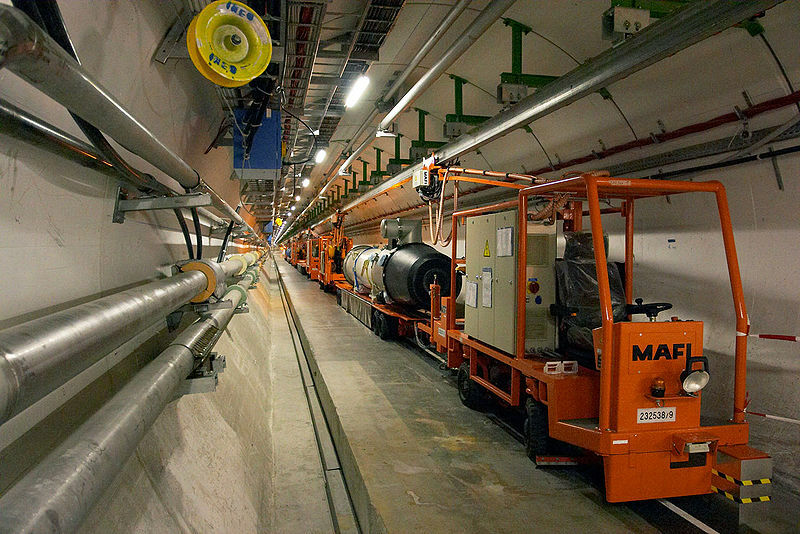 The Large Hadron Collider (LHC) is the largest and most powerful particle accelerator in the world. It straddles the French-Swiss border and lies about 100m below the ground. What makes the Big Bang theory – a theory? It’s important to remember that the Big Bang Theory is a scientific theory – which means that it is a well-substantiated explanation of some aspect of the natural world that is repeatedly tested and confirmed through observation and experimentation. a theory. Like all scientific theories, there is a possibility that it will not stand the test of time at least in its current form. Just because a theory has captured our imagination, that does not mean scientists should close their minds to the drawbacks of that theory or even try to ‘cook the data’ to help it along. Scientific methods tells us to keep an open mind and, in particular, scrutinize that data which does not seem to fit the model or theory. For example, evidence such as Red shift could point to the fact that the Universe is expanding, but our observation that light from distant stars has a Red Shift can also be explained by very different suggestions. Does Science say nothing about the Big Questions? Remember that thought you have sometimes – the one that goes . . .
People often ask questions like . . . If there was a Big Bang, then what was there before the Big Bang? 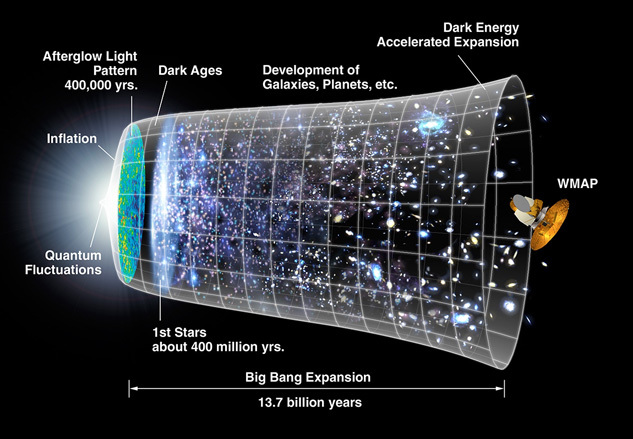 If the Big Bang really happened, what made it happen? Why does the universe exist and was it created? These are some of the big questions of life! And, there are loads of debates and arguments around some of the suggested answers to these questions, but . . .
. . . the bottom line is . . .
no one can be sure which if any of the answers that people offer are right because . . . they are the types of questions that go beyond science alone to answer. ! There are many scientists who have formed and now express opinions about why the universe exists and whether it was created by God. Science can inform our thinking about these questions but they are not the types of question that can be investigated scientifically. Perhaps unsurprisingly, there are a range of viewpoints out there – from the views of the biologist Richard Dawkins to those of the theoretical physicist Ard Louis – though some better documented in the media than others! Now, the thing to do is . . . look carefully at these viewspoints, recognise that they are just that – viewpoints – weigh up these viewpoints with the evidence and reasoning you can find, and then decide which makes best sense to you. Each group member spends 10 mins conducting an internet search using whatever search terms they can think of to produce a list of names of scientists who are associated with the Big Bang Theory. Pool together all the information gathered by individual members in Part 1 and agree on which people were most associated with or contributed the most to the Big Bang theory. From this list of scientists, select 5 scientists that your group will choose to give a PowerPoint presentation on. – Did any of these scientists collaborate with any others (not necessarily from these 5)? Note: be creative! Make it interesting! It shouldn’t sound like a (boring!) biography! Each group is presented with a list of names of scientists – one scientist per group member – so a group of 4 students will be given 4 names of scientists taken from the ‘soup’. Each group member spends 20 mins conducting an internet search to try and find out as much as they can about their scientist. Pool together all the information gathered by individual members in Part 1 and form a chronology for these scientists – whose work came first, whose next . . . whose work is most recent? Create a poster that maps/traces the ideas/stories/explanations that humankind had about the beginning of the Universe throughout human history. Put these ideas/stories/explanations into the context of the everyday lives of people at that time. The same activity can be done in groups with each group taking one particular period in the history of mankind and outlining the ideas/stories/explanations – putting these ideas/stories/explanations into the context of the everyday lives of people at that time. How did people at that time live? How did they make their living? What was the system of government they lived under? How did they view the world? What beliefs did they have? How did their ideas about the beginning of the Universe relate to their everyday lives? What was scientific knowledge at that time? Work in groups (one topic per group) to investigate the following questions (Use Internet, books, scientific magazines) . Create mini-PowerPoint presentations to address each question in as simple terms as possible, because the target audience has little or no knowledge of these concepts. The presentations should be made to the class as though they were at a conference. • Why was the LHC constructed (for what purpose) and what risks does it pose? How do you think decisions were made to go ahead with its construction?